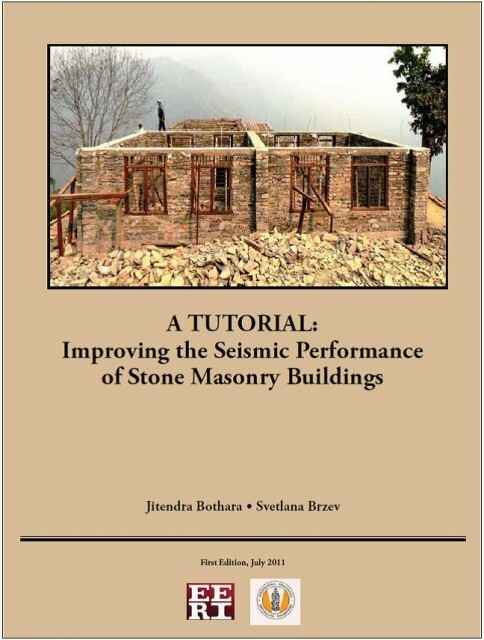 The Bureau for Crisis Prevention and Recovery of the United Nations Development Programme has printed copies of the World Housing Encyclopedia tutorial, Improving the Seismic Performance of Stone Masonry Buildings for distribution through their program in Asia. Authored by Jitendra Bothara of New Zealand and EERI member Svetlana Brzev of Canada, the tutorial focuses on traditional stone masonry dwellings primarily in the earthquake-prone countries of Asia, explains the underlying causes for their poor seismic performance and offers techniques for improving both new and existing buildings. The publication will be shared with UNDP country offices, national governments’ disaster management ministries and offices, and used in training programs. EERI has copies available for the cost of shipping and handling. EERI shipping rates are: $10 to the U.S., $15 to Canada and Mexico, and $20 to other countries. Copies are also available from the National Information Centre of Earthquake Engineering (NICEE) at the Indian Institute of Technology Kanpur. Please contact NICEE (nicee.org) to order the publication from them. EERI’s Concrete Coalition Project has received funding from the U.S. Geological Survey to help further understand the problem associated with older concrete buildings. This USGS-supported project will develop and provide an initial analysis of a database of photographs from past earthquakes that illustrate common deficiencies contributing to the collapse of concrete buildings. Senior experts will develop protocols to determine deficiencies in the photos, and student volunteers will conduct a majority of the analyses. EERI will hire four interns to work fulltime on this project for 2 ½ months in summer 2012. The students will find and analyze photos and possibly building drawings under the direction of senior volunteers and EERI staff. Some database development work may also be required. The expected timeframe for the work will be approximately June 1st to August 15th. A stipend of $3000 will be provided to each student. In addition to the internships, EERI is looking for senior experts who would be willing to spend a few hours a week working with the student interns to find and interpret the photos, and possibly to help design the database. The overarching objective of the USGS project is the development of a more systematic performance database that can help inform modelers, researchers and practitioners. It offers an opportunity for students to be involved in a meaningful and potentially ground-breaking exercise, and will link students with senior experts in the field. The product will be a credible and accessible record of concrete building performance in past earthquakes. This database will provide information on the relative importance of deficiencies with respect to collapse and vulnerability as well as information on actual failure modes for a variety of construction types, which can improve vulnerability relationships and the accuracy of regional loss estimates. For buildings where the exact location is known, the protocols may include the use of ShakeMaps from the global atlas to identify ground motions to which the building was subjected. Recommendations will be made by the Technical Manager in consultation with the senior advisory panel on how the deficiency factors can be used to modify vulnerability functions for older concrete buildings in various countries in the world. To apply for one of these internships, please send a cover letter and your resume to Maggie Ortiz at EERI (Maggie@eeri.org) by April 16th. Interviews will be scheduled for the week of April 23rd, and decisions made by April 30th. If you have any questions about these internships, please feel free to contact Maggie or Marjorie Greene at mgreene@eeri.org. To volunteer as a senior mentor or expert for the project, please contact Craig Comartin, director of the Concrete Coalition (ccomartin@comartin.net) or EERI staff member Marjorie Greene at mgreene@eeri.org. Questions? Feel free to contact either Craig or Marjorie. The Concrete Coalition is a network of individuals, governments, institutions, and agencies with shared interest in assessing the risk associated with dangerous non-ductile concrete buildings and developing strategies for fixing them. It is a program of the Earthquake Engineering Research Institute, the Pacific Earthquake Engineering Research Center at UC Berkeley, the Applied Technology Council and their partners, including the Structural Engineering Association of California, the American Concrete Institute, BOMA of Greater Los Angeles and the U.S. Geological Survey. EERI’s Learning from Earthquakes project has a new website. 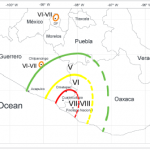 The new site features the LFE Reconnaissance Archive (see below), a searchable/sortable table, which contains resources for nearly 300 earthquakes. For each earthquake there is an event page containing photos, reports, and links. Users can search and sort the archive by event, location, magnitude, and date, making it easier to find the information you are looking for. Check out the new Learning from Earthquakes home page or go directly to the LFE Reconnaissance archive.